So after a small wait, Neymar has opened his account in La Liga. It doesn't matter as he is already have assisted 5 goals in last 5 outings. 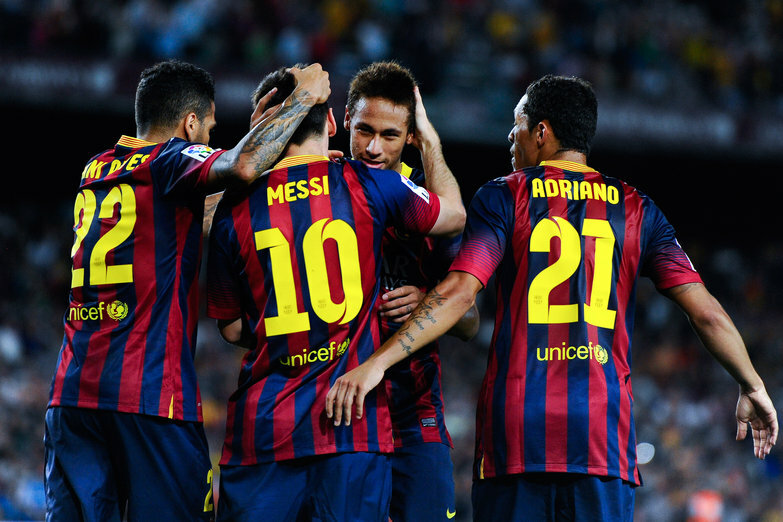 Barca marched onto their defense of title with a brilliant 4-1 victory against Real Sociedad. 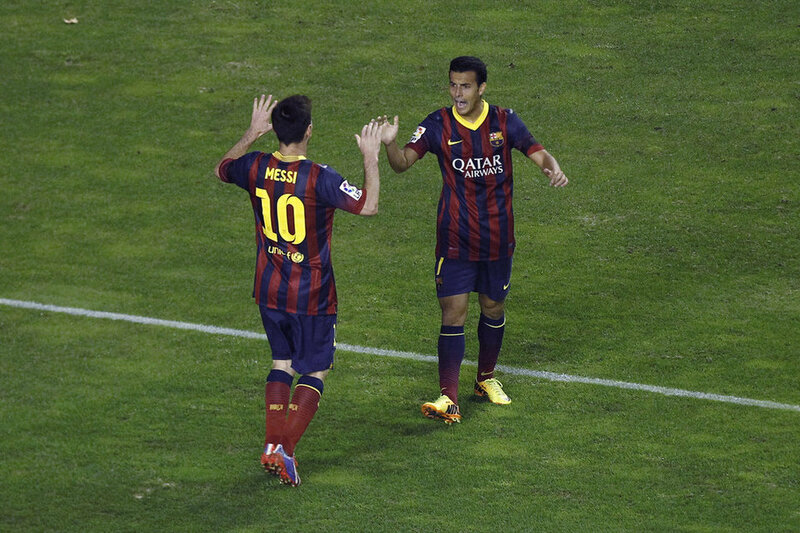 Barca continued with their excellent start to the season with 4-0 victory over Rayo Vallecano. Usually a 4-0 victory would be described as a thrashing. But not this one. This was even for most of the parts, the difference was our strikers were able to cash on the chances at the correct time. The match was to an extend an exhibition of how fragile our defense was, it was understandable as there were some changes which exposed them a bit.Martino continued with his rotation policy, this time Montoya finds a place in the starting line-up instead of Dani Alves. The back four for this outing was Montoya, Mascherano, Pique and Adriano. The midfield trio also saw the rotation with Song finding a place in starting eleven; a rare start along with Cesc and Xavi. The front three was Pedro, Messi and Neymar, more or less expected. In the first Official Clasico of the season, Barca boys emerged victorious. Another Lionel Messi hat-trick gave Barca the perfect start to the UEFA Champions League 2013-14 season. Sometimes we take this guy for granted; then it's undertsandable when someone scores at the rate like him. In the end the Little Genius on the Pitch made the big difference. It was the 93rd minute, the fans were losing hope but still called for a last push, the players almost gave up, Barca has conjured up a way to give up a healthy two goal lead, many fellow cules switched off their TV, I almost did till I saw the determination of Lionel Messi; so I decided to wait for the final whistle and that was the best decision I made for some time. Let's be honest, had it not been for Lionel Messi we would be sitting and thinking how we managed to end up losing two points. In a way that's cruel on other players, for most of the match most of them were better than the Argentinian. I don't think we have seen Messi playing this crap in some time. It was horrible to watch him in the first half, constantly losing possession, every attempted mazy run getting blocked, over hitting deliveries; it wasn't the Lionel we knew! On the contrary the newcomer Neymar simply majestic, he was terrorising any player defending on the left; at times they simply gave up; he was simply magical. But in the end had it not been for the Argentinian his whole hard work would have gone to waste. Is there any better way to kill time when the players are away on International break? Don't think so. Ronaldinho's majestic performance earned him a standing ovation at the Bernebeu, something only repeated for Maradona previously. Andoni Zubizarreta's contract at Barca will be extended by two years till the end of June 2016. The contract would have ended at the end of this season, but unfortunately it also had the option to extend it for further two years; had the club been impressed by his work. And now the club is looking to reward Zubizarreta's performance, which involves nothing other than being confused at the state of affair with two additional years. Then it comes as no surprise to anyone who follows Rosell's policies. Andoni Zubizarreta in simple words is a great servant for the master, and is been rewarded for that - his loyalty. His performance as the the Sporting Director reached his pinnacle this transfer window with the club looking absolutely clueless and desperate. The club simply resembled a bad joke in the transfer window, only to be outdone by David Moyes and Company. A first half hat-trick from FC Barcelona's little Argentinian magician, Lionel Messi helped in edging past a resolute Valencia at the Mestalla. This was the first hat-trick of Messi in the season and we only had to wait five official games for it. All five goals of the match came in the first half, with Valencia hitting twice only in the injury time. In my FC Barcelona vs Valencia preview, I did write about how tough our previous visits to Mestalla have been. This one was no different with the rhythm swinging to and forth throughout the match. It was real end to end stuff, something we all expected and in the end these three points would feel pretty vital. We did have our negatives from the match, especially with Busquets injury. But it could work to our benefit as he could be left out of the National duties. Let's wait! 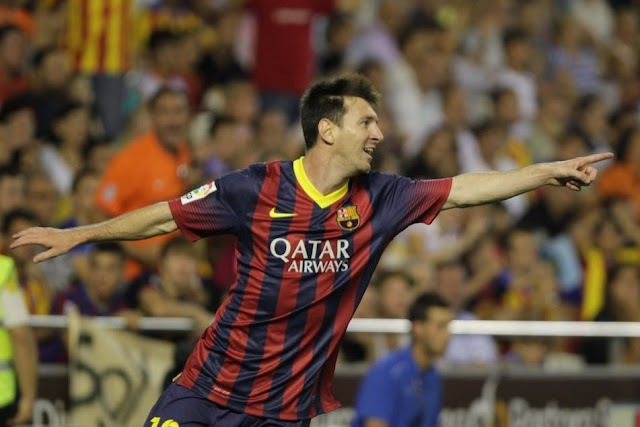 Sensational hat-trick by Messi secured Barca all three points at Mestalla. The five goal thriller had a breath taking first half in which all the goals were made.